Once upon a time, the ghost of an iconic WW1 poet made an appearance on a road familiar to the poet conjuring up the ghosts of other WW2 survivors. Heaney describes the place, the event and the supporting cast in some detail. 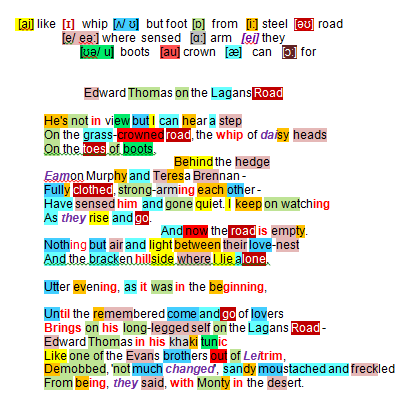 Heaney provides a dramatic continuo sound effect of approaching footsteps … an incoming ‘presence’ as yet unseen: a step on the grass-crowned road, footsteps with purpose echoing the whip of daisy-heads on the toes of boots. However the stage is not yet prepared for his entrance … a man and woman in their lovers’ hide-away are engaged in passionate but amateur sexual foreplay (fully clothed, strong-arming each other); they hear, sense they are intruders and are minded to leave. The scene is now ready for epiphany (the road is empty) a minimalist stage-set, all nature: nothing but air and light between their love-nest and the bracken hillside. His memory is of a superlative moment: utter evening, age-old as it was in the beginning … and unchanging (‘is now and ever shall be’, unsaid but invited parody of the religious doxology of praise). He picks out out a real memory (the remembered come-and-go of lovers) that provided the poetic charge that brings on the ghost. … in uniform … resembling similar young Irish WW2 fighting-men of two generations later, demobbed (officially released from military duty) and judged, much to the relief of their nearest and dearest ‘not much changed’ by the trauma. Survivors of both wars were often broken, shell-shocked men, even if physically uninjured. These Leitrim demobbed soldiers bore the signs of health (sandy-moustached and freckled), standing tall from being, they said, with Monty in the desert. as it was in the beginning: mimicking Christian doxology in praise of … God … Lagans Road?